Ah, this takes me back to my GCSE history lessons with Mrs Dodds where we learned about the golden age of silent movies and how the 1920s inspired a new generation of actors and actresses. Silent Screen is an ode to one of the wonderful times in movie history that has been beautifully covered by classic films including Singin’ In The Rain and The Artist. This 5-reel, 25-payline slot from renowned developer Cryptologic is a slots tribute to this great era. If you're expecting to see animated versions of Charlie Chaplin and Lillian Gish in all their glory on the reels then you'll be disappointed there's an idea for a future version of this slot. Now that would be a slot that I could get on board with! Symbols on this slot include a director, a cue card, a camera, a car, an actor, an actress and all of the usual regular 9-through-to-Ace symbols. The actress symbol acts as the Wild and substitutes for all other symbols except for the Scatters to complete winning combinations. You can also earn a 5,000 coin pay out if you manage to hit five actress Wild symbols across the reels. There is a free spins bonus round in Silent Screen and this is triggered when you hit three or more of the camera Scatters across the reels. You will initially be rewarded with 15 free spins and all wins earned during the free spins will come with a 3x multiplier. It is possible to re-trigger the free spins if you hit three or more Scatters across the reels during a free spin. This slot is also part of the Movie Mayhem Jackpot that is linked in with a number of Cryptologic slot titles. It is randomly triggered and will be awarded to a player playing on a Movie Mayhem Jackpot slot. This is a nice little added incentive to play this slot, even if the chances of you being lucky enough to trigger the jackpot are remote at best. 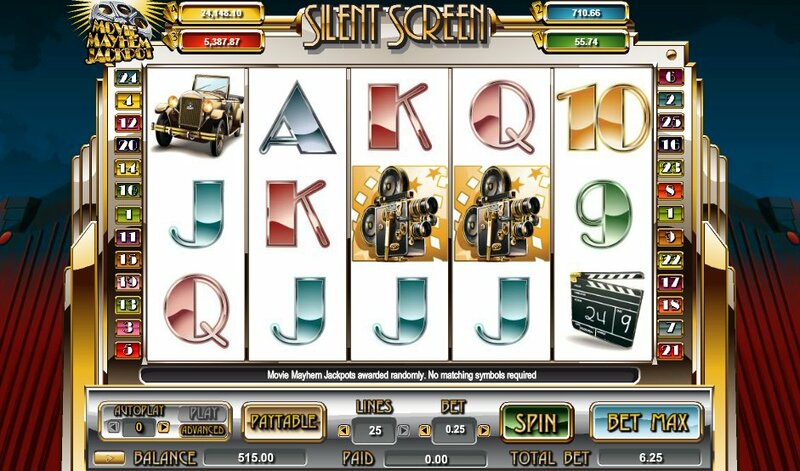 Silent Screen is a no fuss or feathers slot. The free spins bonus round is the only bonus feature on offer which is a shame but the free spins are great fun with 15 spins awarded immediately and the potential to trigger more. I am a big fan of the movies and movie-themed slots are a slight weakness of mine. If you are the same as me then you might want to check out Sheriff Gaming’s 3D slot bonanza Billion Dollar Movie or Betsoft Gaming’s 3D offering in the form of At The Movies.